One of 2014's most requested blog posts so far has been an updated skincare routine - my skin AND skincare have both changed a lot this year and my current routine has worked wonders for me. I've written about my troublesome skin before but to sum it up; I have oily-combination skin, it's oily around my T-Zone and dehydrated on my cheeks. I'm prone to breakouts and up until a month or so ago, I had blemishes constantly. 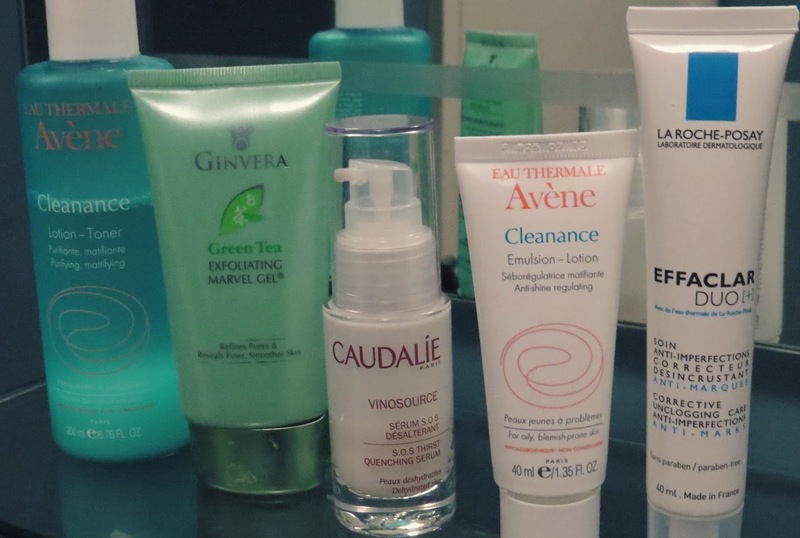 My skin has only settled since starting a new skincare routine, watching what I eat a bit more and starting a new contraceptive pill (maybe a bit TMI for you all but the right one for you can benefit your skin greatly). 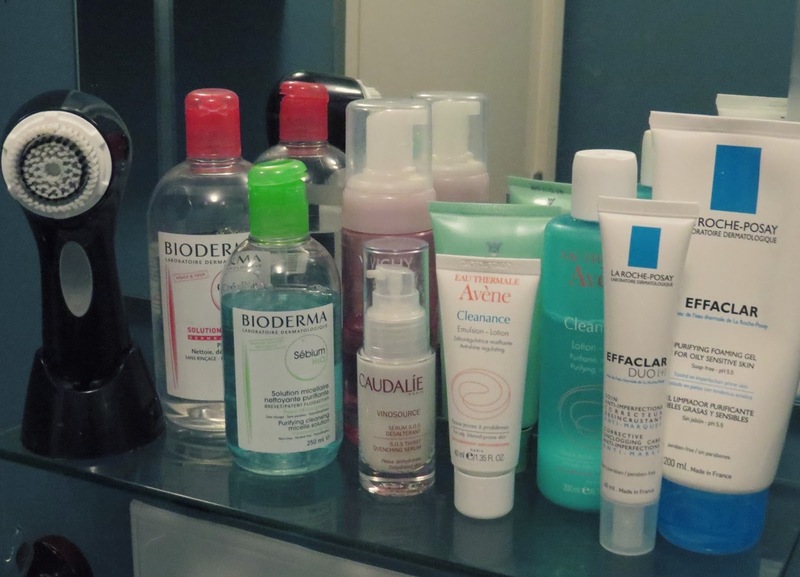 Unintentionally most of my skincare products are French - I only realised this as I was taking the photos! Beauty journos and bloggers alike have harped on about French skincare for an eternity and to be honest, it really lives up to the hype. I got on really well with using Simple skincare last year as it was an affordable option for me and suited me at the time, however due to a load of stress towards the end of 2013, my skin needed a complete changeover. I've been using every product you see below for at least 2 months (some have been repurchased) so I can give you all thorough and honest opinion on everything here. CLEANSE: One of the biggest revelations in my routine has been the introduction of a skincare tool; before I used my hands, cotton pads or a wash cloth, nothing fancy. Clarisonic's sonic cleansing brushes are loved worldwide, I've read and listened to hundreds upon hundreds of reviews singing their praises. I was introduced to the Clarisonic Aria back in January and honestly believe my skin's condition has improved an enormous amount because of it. €199 is a big investment for a skincare tool but it is completely worth it - trust me! I tend to use it in the mornings mostly, at least 5-6 days a week. It is recommended that it's used daily both morning and night but I find myself being far too lazy in the evenings to stick to this. Using the Aria every morning not only wakes me up but it leaves my skin feeling exfoliated and fresh as a daisy for the day ahead. I apply a dollop of my Vichy Pureté Thermale Foaming Cleansing Water into the centre of the brush head and cleanse my face along to the brush's timed system (60 seconds in total). It's water-resistant, re-chargeable and completely fool-proof. If I have a blemish or two, I swap the foaming cleansing water with La Roche Posay's Effaclar Purifying Gel. It works a dream with combatting problem areas when used in conjunction with the newly jazzed-up formulation of La Roche Posay's Effaclar Duo+ (more on that later). Both facial washes are gentle on the skin yet give you a thorough cleanse. When I arrive in from college or from meetings at night, I switch into lazy mode and can spend no more than 2-3 minutes on my skincare routine. I refuse to ever go to bed without removing my makeup mind you so I find myself using a speedy yet effective routine to cleanse at night. 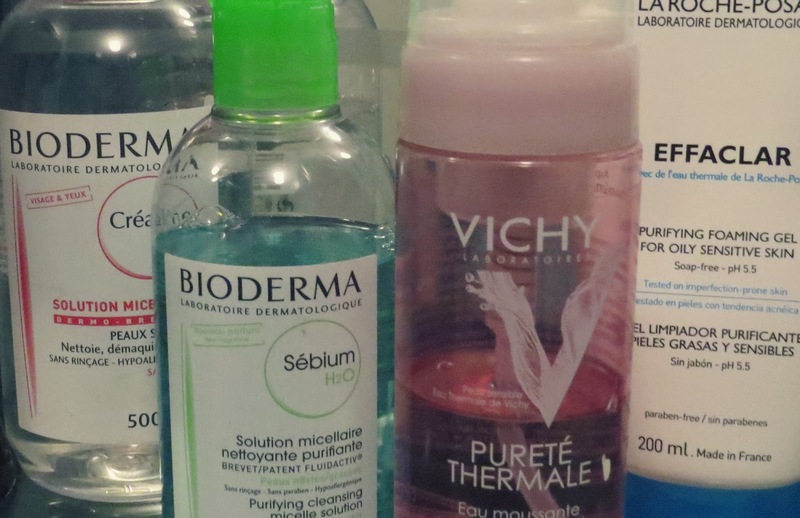 Face wipes are the devil of skincare (although I find Simple's selection to be just fine, in my opinion) so I use the next best thing: micellar water! Unless you've been living under a rock over these last few months, I'm sure you've seen the explosion of love for micellar waters. I currently use the famous Bioderma Sensibio H20 Micelle Solution designed for sensitive skin (pink bottle). It removes ALL of my makeup within a minute or two and doesn't irritate the skin in the slightest (it even removes the toughest of mascaras and waterproof products). If I have blemishes, I switch to using Bioderma's Sebium H20 Micelle Solution designed for oily-combination skin (green bottle). It smells like suncream and I think I'll be re-purchasing it over the sensitive skin solution purely because of this, it's so yum! TONE: I love toner - it's still my favourite skincare product, toner leaves your skin feeling tingly and fresh instantly! It closes your pores after cleansing and removes any last bit of makeup or grime that's on the skin. I've been using Avène's Cleanance Purifying Mattifying Lotion designed for blemish-prone skin and I'm absolutely adoring it. It's lightly fragranced like most Avène products but it's nothing too overpowering. It doesn't leave the skin feeling uncomfortably tight and it doesn't irritate my eyes at all (which a lot of toners do). I highly recommend introducing it into your routine if you have blemish-prone or oily skin. If you're looking for a cheaper alternative, try Simple's Soothing Kind To Skin Toner. MOISTURISE: Moisturising has always been a hit and miss routine step for me - I've experienced a lot of moisturisers either worsening my skin's condition or completely creating a whole new blemish problem altogether. I can honestly say I only thoroughly love around 4-5 moisturisers on the market right now. Moisturising tends to scare a lot of people off, especially if they have oilier skin - however, it is 100% essential! Starting to take care of your skin whilst you're young will benefit you greatly as you get older. One of the best tips I've learnt from beauty gurus over the years, is to start using a serum. Serums are relatively new to the general market and can put off people with their price-points. 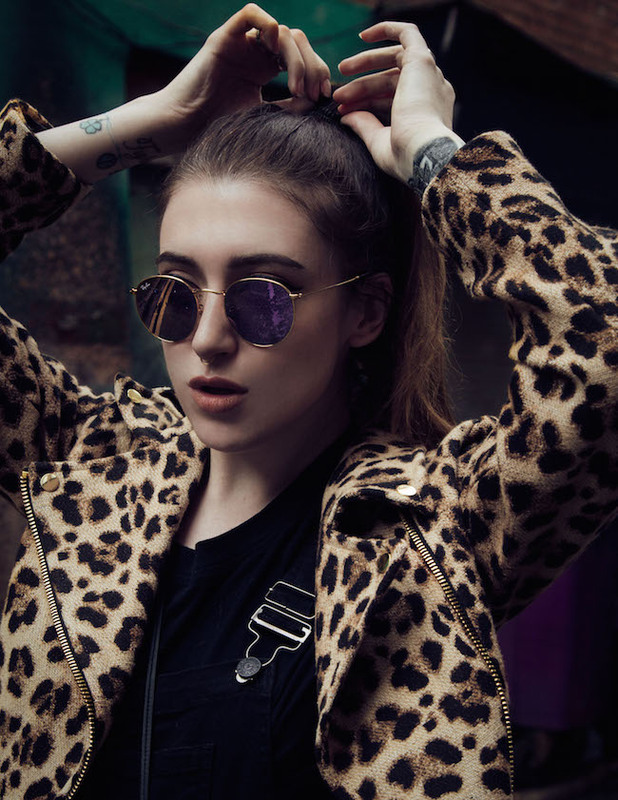 Serums are an investment buy and tend not to come as cheap as other skincare products. Serums sink right down into the skin's layers and moisturise at a deeper level than a regular moisturiser. I've been using Caudalie's Vinosource S.O.S Thirst Quenching Serum for months now and I still have half of it left in the bottle! I adore this serum because it feels like water as opposed to an oil (which I personally hate the feeling of. It's oil-free, so voilà). I squirt it once on to my finger tips and lightly press the product on to my face focusing in on my driest areas (my cheeks especially). It sinks in within seconds and I go straight in with my moisturiser. I'm currently using Avène's Cleanance Purifying Anti-Shine Regulating Emulsion-Lotion both morning and night. It's a gel-like formula, lightly-scented and it glides easily on to the skin and sinks in relatively quickly. It's fantastic for under makeup as it mattifies your skin (especially around the nose and forehead) and I find myself not using a primer as much since using it. Although it isn't my favourite moisturiser of all time (Nuxe's Nirvanesque Light is my all-time fave, FYI), it is a fantastic moisturiser to use alongside other blemish-fighting products because it isn't harsh on the skin and does what it says on the tin. EXTRA: I've blogged about Ginvera's Exfoliating Marvel Gel before but I had to give it another mention because it's still rocking my world! It is by far the greatest exfoliating facial product I have EVER used and it's something I see myself re-purchasing until the end of time. Some may look at the price and think it's ridiculous for an exfoliator but it is worth every cent. Throw away the harsh exfoliating washes and creams you use ASAP, that practically tear your skin up with small rocks and craters! This gel is magic; you basically squeeze the gel on to your fingertips and apply it to your dry face (cleanse beforehand I've you've makeup on) and massage it in. The second you do this, the dead skin starts coming off in your palms - it sounds gross but you can see and feel the exfoliating happening - it doesn't hurt or feel uncomfortable at all. The gel doesn't irritate the skin in the slightest and your complexion looks facial-fresh after you wash the dead skin off after. It is literally one of the greatest skincare products I've ever used, I can't recommend it enough! If I have blemishes, I currently tackle them by using La Roche-Posay's Effaclar Duo +. Their original Effaclar Duo formula is adored worldwide with 3 tubes being sold every minute - however this re-vamped formulation not only targets blemishes, it banishes scarring and the marks left by blemishes and acne. I have extremely pale skin so I'm always left with red marks from a blemish that can take weeks to disappear, I apply this directly on to my blemishes every night and always notice a huge difference when I wake up in the morning. If a blemish is extremely bad, I tend to put some of my beloved Sudocreme on top of it and it really conquers the spot within hours. Effaclar Duo + is moisturising so it doesn't dry up your skin at all, which is surprising for an anti-blemish cream. It's fantastic and the countless reviews I'm reading of it are mostly all positive too. It's worth giving a go if you want to combat skin issues, especially in terms of scarring. I know that was one hell of a blog post essay but I'm genuinely so content with my current skincare routine. It's working better than any previous routine I've had and I have more or less no blemishes on my face at this very moment. My blemishes have decreased, my pores have practically disappeared, I don't have blackheads around my T-Zone and my overall complexion looks plump and healthy. I hope some of you really get something out my routine and recommendations, let me know if you plan on trying any of the above!